Yamaha RX-A3040 review | What Hi-Fi? The first impression we have from the Yamaha RX-A3040 is one of scale. This £2000 nine-channel amplifier sits at the top of Yamaha’s celebrated Aventage range of AV receivers, and it duly shows off its flagship status by delivering an astonishingly mammoth soundfield. And that’s before we even get to Dolby Atmos. Play the Edge of Tomorrow Blu-ray (with 7.1 DTS-HD Master Audio), and the soundfield that envelopes you is huge. You get a real sense of the scale of the battlefield. The distant sounds of fighting, the helicopters overhead and the bursts of gunfire – all are delivered with plenty of detail to convey a large, chaotic atmosphere. Yamaha excels in surround sound effects, and the RX-A3040 steers the violent whirring of the aliens’ tentacles through each speaker with power and precision. It makes the movement, and menacing threat, of these terrifyingly fast aliens very palpable. There’s a meaty rumble to the basslines, and the quieter moments have ample space to breathe in and hit those emotional notes. If a standard 7.1 soundtrack sounds wide and spacious, then Dolby Atmos sounds even bigger. And taller. Play Transformers: Age of Extinction (currently the only Blu-ray film available with Atmos soundtrack) and the ceiling virtually disappears. It’s less about what objects you can hear above you, and more about the vast space that’s just opened up for a bigger, cinematic experience. It sounds more powerful, too. As a showcase for what Atmos can do, the Yamaha amp sounds hugely impressive. But it’s not all plain sailing for the RX-A3040. For a start, it’s not quite as punchy as we’d hope. Impacts could be stronger, tauter and have more wallop. There could be more detail and refinement overall, too. It seems that in going for a bigger sound, Yamaha has traded in some of that finer subtlety and agility that made it such a delight to listen to. This affects voices, too, which aren’t as direct or nuanced enough to let us fully engage with the characters and their story. Rival Pioneer SC-LX88 does a more successful job of keeping you hooked and drawn into the unfolding action on screen with its stronger, subtler delivery of dialogue and razor-sharp precision. Its rounded-off, smooth approach is in keeping with its predecessor – the 2013 Award-winning RX-A3030 – and makes the sound easy to listen to. It’s worth nothing that while the old RX-A3030 doesn’t have the same clarity and scale as the new amp, it does sound punchier and more solid. The RX-A3040 performs well enough when it comes to music, although our misgivings about rhythmic punch once again come to the fore. The stop and start of notes could be more distinct, and songs played via USB sound a tad more solid and cohesive than streamed over Spotify. It’s listenable, although we’d suggest you plug in a dedicated stereo amplifier if you’re settling down for some serious listening. And while Yamaha has a variety of fun sound programs (which are more successful than its rivals), we’d pick stereo mode for the most cohesive performance with music. The Yamaha RX-A3040 is decked out with the latest streaming features: Spotify Connect, Napster and vTuner internet radio service. You’ll never run out of music to listen to, and that’s before we get to ways you can play tunes from your smart devices. Those with Apple devices get a good deal. Not only can you stream songs over AirPlay, you can also plug your iOS device into the front panel USB for playback and charging features. You can even transfer your device’s wi-fi settings to the receiver via USB – it’s a neat option that we’re particularly fond of. For other devices, you can always play music over your home network. Wired and wireless network connections are both stable, and DLNA certification means you can stream songs stored on a laptop or NAS box – as long as they’re connected to the same network. The Yamaha receiver can handle hi-resolution files of up to 24-bit/192kHz in WAV and FLAC formats over DLNA and USB. Android users can also directly stream HD content using the MHL input on the front panel. Yamaha doesn’t include built-in Bluetooth. You’ll have to plug in the YBA-11 receiver (which costs around £50) if you want the convenience of Bluetooth streaming. It’s not a huge setback, but we wish the module came with the amplifier. As expected of a top-of-the-range amplifier, the RX-A3040 has an extensive list of connections. The eight HDMI 2.0 inputs are the highlight, all of which support Ultra HD 4K pass-through and upscaling, as well as the standard Full HD 3D content. There are two HDMI outputs, two dedicated subwoofer outputs, and a host of digital and analogue connections on the back panel. There’s plenty of scope for plugging in older AV kit that doesn’t feature HDMI, with multiple component and composite sockets available. 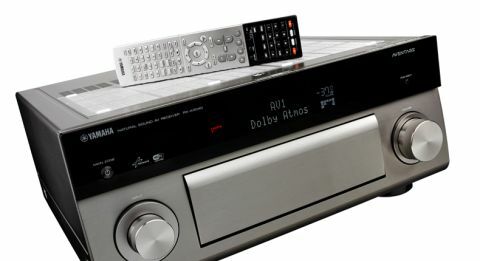 The aluminium-clad Yamaha receiver is a sturdy, well-built chassis, exuding a build and finish quality that fully lives up to its premium billing. It’s a hefty machine, too. Available in black or titanium, the amp has a clean fascia, a crisp display, and control dials that are intuitive to use. Various control buttons and additional inputs are neatly hidden away under the panel. Whether you have a standard 5.1 speaker package or setting up Atmos, it’s imperative that you run the auto-calibration to optimise the RX-A3040’s sound with the speakers and your home cinema room. We do wish the amp came with clear instructions on how to set up Atmos speakers in detail, though. It currently involves delving deep into the manual speaker settings (and its many subfolders) to choose the right speaker configuration, assigning your extra speakers as Atmos, and ensuring the amp is set to surround mode. This may be daunting and confusing to users without a handy guide. The standard remote control fits nicely in hand, and is incomparable for swiftly changing inputs or adjusting the volume. The remote’s ‘surround decode’ button is crucial when playing Atmos soundtracks. For those wanting to use their smartphone or tablet, the AV Controller app is worth a download. Free for Android and Apple users, the app is a neat way of adjusting all aspects of the amp (including speaker settings), as well as offering a swift way of selecting inputs and Yamaha’s numerous sound programs. If our judgment were based purely on how big and spacious an AV receiver sounds, the Yamaha RX-A3040 would take the five stars easily. It’s a powerful beast, but is let down by not delivering the subtlest, punchiest and most captivating performance that money can buy. But don’t completely dismiss the RX-A3040. There’s plenty to love about its big, smooth character, its wealth of features and that immense soundfield. And let’s not forget it’s capable of playing Atmos soundtracks. Whether you’re going down the Atmos route or not, this RX-A3040 amp is well worth an audition.